This SuperChiller Immersion Chiller 50' x 1/2" is a great way to speed up the chilling process for home brewers who frequently brew large batches of beer. 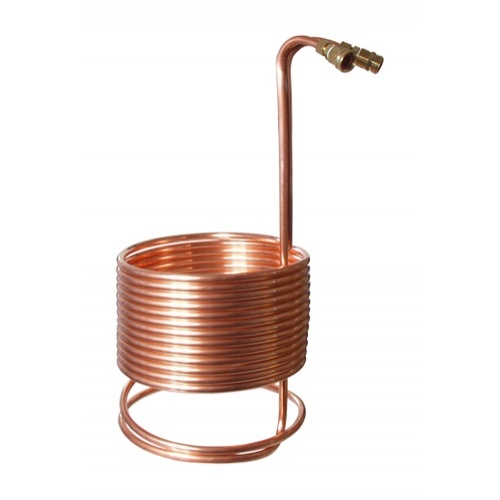 This fast, efficient immersion chiller is made of 50 feet of 1/2 inch copper tubing, wound into a tight stack of 12 inch diameter coils which can cool your wort is a fast as 20 minutes. The SuperChiller features standard garden hoses fittings on the inlet and outlet, making for easy connections. Compatible with any of our 14-30 gallon kettles, or any other kettle that it can fit inside. Needed a second chiller for Summer brewing. I already have the 5/10 copper chiller and love it! The garden hose fittings are what keep me coming back to More Beer! Excellent... But check the fittings. The fittings were loose out of the box, but I checked it before using. Boiling to 65 in 15 min. I've been eying a plate chiller but this thing cools 10 gallons in 15 minutes on a 100+ degree Arizona day. The only addon I need is an adapter to cool me. Oh wait, that's beer. This chiller has worked great for me with my Braumeister - 50L system. It generally cools 5 gallons of wort in about 15 minuets. I find that I have to be careful not to get the chiller coils tangled with the heating coils of my brew system, but that won't apply to everyone. I haven't experienced any leaking from the fittings. This chiller is rather large so make sure your system can accommodate it. I am so happy I decided to spend a little more to get this longer, larger diameter wort chiller. It cools over 6 gallons of boiling wort down to 70 degrees F in about 20 minutes on a hot day. I've never had a leak. It's built like a tank, and it's easy to keep clean and shiny. This thing is BIG. Make sure it will fit in your kettle. I use mine in a RIMS system circulating ice water through the coils. Will bring boiling wort down to pitching temps in just minutes. I'll never have to buy another. I had issues with the compression fitting leaking, but Morebeer sent me a new one without hesitation. I would definitely recommend this product because they stand behind it. Good chiller, especially with the recirculation. Compression fitting leak a bit, but nothing bad. This chiller has worked great. Chills 5 gal in about 15 min. I have since converted it to a HERMS coil with great results. I've assisted in a couple of batches with a friend that does ice baths for his cooling. I recently began brewing at my place and bought this chiller. I brew a full 5 gal boil in a 15 gal kettle. This "Super Chiller" is just that, Super! I can now cool my 5 gal wort quicker with this tool than cooling my 1800ML yeast starter in an ice bath. The ease of use and cleaning is mind blowing, I am super excited for making this purchase. I highly recommend this product. Update, been using this chiller for a little over 2 years now. I still love it but I am only brewing 10 gallon batches now and it does take 35-40 minutes to cool to 68-70 F. This thing still looks great, I've only ever sprayed it off after boils and periodically I'll boil it in just water to get a good clean. Soon to upgrade to a plate chiller and use this guy in a closed loop with a pump as a pre chiller. Overall this is a nice chiller. There is a female garden hose fitting for the lower coil and a male fitting for the top coil side. It isn't a big deal, but those should probably be reversed for optimum cooling if you aren't using the pre-chiller and just plan on hooking up the garden hose. The idea is to hit the hottest part of the wort with the coldest water right? (hence the reason for the gap between the first coil and the rest) You may keep washing machine disconnects handy to adapt your configuration if you care about this kind of thing. Mine doesn't have the space after the first coil as shown in the picture so I will have to try and shape it some. The fact it's soldered at the top will limit what I can do. I've had several chillers and this one is the fastest yet. Always amazed by its speed. I brew all grain batches which can take quite awhile so any piece of equipment that can help speed up the process is a nice tool to have. Tons of surface area to get that wort cold fast! A big chiller with tons of coils. Mine benefited from a bit of copper wire, looped around the bottom few coils, to allow wort to flow through the coils at the bottom (when used with a whirpool chiller). Helps cool your wort down fast. Well constructed, good quality and ultimately does the job. Even with high ground water temps in GA this will drop your wort temp down very quickly. If you have a pump, add the "Jamil" option (recirc arm option) to help increase the efficiency with this unit and set up a decent whirlpool. I have had this for four or five years, thing is made very well and hasn't lost its shape like home-made ones I have seen. Great size for my kettle, less fuss than a plate chiller. Crashes my wort down fast! The hose fittings are great, no more messing with clear plastic and clamps. Fittings are great, and it can give you a solid cold crash, but in general I prefer stainless steel as it's cheaper and more durable.